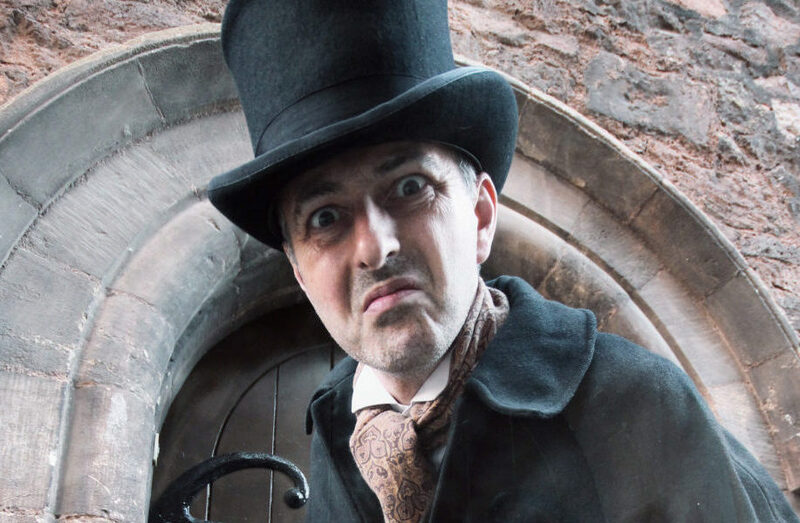 Freezing Ebeneezer: Wandering Tiger’s promenade Dickens adaptation is fun but frigid. Humbug!, St Nicholas’ Priory, Exeter. Photo: Wandering Tiger. It’s a mark of how deeply ingrained the Muppets’ version is that if you mention A Christmas Carol to me, I’ll think about how Gonzo is here to tell the story (and Rizzo is here for the food). Wandering Tiger’s Humbug!, written and directed by Luke Jeffrey, is another in a long line of adaptations that takes creative license with the plot of Dickens’ ghost story. Most of the main beats are there, but adapted for a promenade production and for a cast of three, with Charlie Coldfield as Scrooge, and Richard Feltham and Benjamin Akira Tallamy as pretty much everyone else. Coldfield is a grouchy yet earnest Scrooge, who sticks with the Michael Caine school of playing the straight man in an otherwise comic re-telling. But whilst Humbug! talks him up as the main concern of the plot, it often doesn’t feel like his story, and Coldfield isn’t given much space to really get going with the role. Instead, the show is absolutely stolen by Feltham and Tallamy and their charismatic, comic takes on the other characters. Tallamy in particular has a flair for improvisation and self-deprecating audience interaction, and his witty, idiosyncratic take on the Ghost of Christmas Present feels genuinely different from previous interpretations of the character. The show also gains much of its warmth from Tallamy’s original Christmas songs, which are a welcome departure from traditional Victorian dirges. The venue itself is stunning, even if it’s freezing cold throughout (wear layers, definitely take gloves). Founded in 1088, St Nicholas’ Priory is a hidden treasure that rightfully becomes the fourth member of Humbug!’s cast, and it’s fascinating to follow the action from room to room; we glimpse a high-ceilinged Tudor bedroom, and journey to the depths of the crypt-like cellar. But the pace frequently lags as we’re shepherded, single-file, through narrow corridors and down spiral staircases. There’s a lot of us to move, the scenes don’t start until we’re all present and correct, and the cast have to work hard to recapture the atmosphere and momentum that gets lost in transit. There are a lot of different performance techniques going on in Humbug!, with a few innovative flourishes. There’s genuine magic in the haunting scene at the beginning, and more later during a captivating moment of projection. A puppet version of Marley’s ghost is appropriately spooky and gorgeously crafted out of paper money wrapped in the usual chains. A later puppetry moment doesn’t work as well though, as the lack of a female cast member gets unintentionally highlighted by the inclusion of Scrooge’s fiancée as a dress on a coat hanger. There are some interesting moments of audience interaction, some of which add to the atmosphere and some of which detract from it. I love Feltham’s omniscient delivery of collected audience memories of their past Christmases; I’m less enamoured with an out of context drama game we play to entertain an offstage Tiny Tim (drama games – bah humbug!). The ending, which takes a twist away from the original, includes a crucial moment of audience involvement, and while this creates a nice emotional moment for Scrooge, it also doesn’t hold up that well if you think about it too much afterwards. But there’s no denying the effort made to keep the audience part of the action, and there’s a genuine feeling of camaraderie as we’re shuffled and reshuffled through the amazing spaces of the priory. All in all, Humbug! could benefit from tightening up the storytelling and relying less heavily on the assumption that everyone already knows the plot (even if this is likely justified), but it does succeed in making the audience key players in this re-imagined version of A Christmas Carol. Humbug! is at St Nicholas’ Priory, Exeter, until Christmas Eve. For more details, click here.